Up and Over garage doors are by far the most common garage door type within the UK still today. Their simple one piece panel construction makes them very easy to use and provide both a low-effort and zero hassle operation. 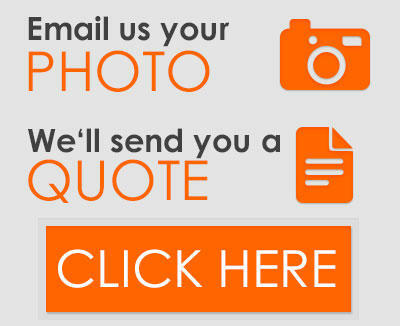 The Garage Door Centre can offer you an enormous choice of designs and materials for your new up and over garage door and will always make sure the size and gear type is correct for your requirements. After all, if you do not buy the correct garage door you may not be able to actually use your garage for what you first intended it for! Up and over garage doors fall into two main categories for their types of operating mechanism - canopy or retractable. This is how the one piece garage door panel opens and closes, and both mechanisms have their uses in different applications. 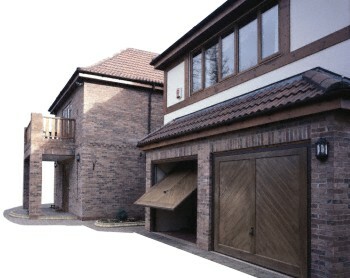 The illustrations further down show both garage door types half open with the optional steel fixing sub frame attached. Always remember that an up and over garage door requires a fixing sub frame - either in timber or steel - it will not fit directly to any garage structure properly without the sub frame! This needs to be fitted inbetween or behind the structural opening. The canopy garage door is the simplest and most common type of up and over garage door mechanism, its name is derived from the fully opened garage door panel protruding about a third forward of the sub frame to form a canopy. It gives the maximum drive-through width when open and is the easiest to install on site. The door is balanced and assisted by torsion springs positioned above the door panel on the head of the fixing frame. 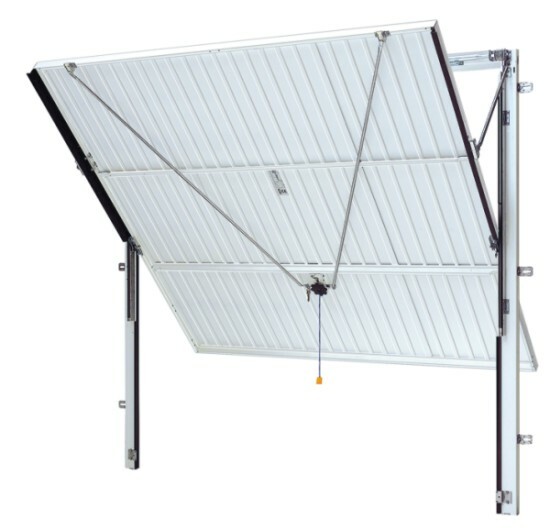 The canopy door mechanism is generally only available up to 8 feet (2438mm) wide. It is not generally used if the garage door is to be electric motor automated, although with the use of a good quality 'bow arm converter' and a reasonably powerful and high quality electric operator this type of door can be automated successfully, just get some good advice first. The retractable garage door is becoming the more popular type of up and over garage door mechanism in the UK, its name being derived from the one piece garage door panel retracting fully into the garage when open. It is the mechanism that will convert easily and safely into remote control electric operation with the least equipment required. The drive-through width on a retractable mechanism is always reduced as the lifting arms sit in between the sub-frame when the door is opened so be careful when limited for width that you do not restrict access too much. See the videos below to visually undertand how canopy and retractable door gears function. Steel garage doors are generally powdercoated in white as standard with optional brown, black, green, red, blue and some other newer colours. The most recent innovation is the Decograin or Weathergrain finishes which are attractive laminate foils applied to the outside face of the door panel to simulate different attractive wood finishes, these are very effective and come with a 10 year guarantee. GRP (fibreglass) garage doors are available in ever changing finished woodgrain colours and are all hand finished so never expect quite the same finish as a sample you may obtain! The 'base' colour of the door is in the gel pigment used to make the door in the first place and the final front finish is hand applied. Timber garage doors are increasingly available in fully finished colours using microporous wood treatments. The most popular form of supply however is still base coat stained for final finishing on site in order to coordinate with other timber finished on the property. Cedarwood is the preferred type of timber for garage doors due to its excellent tolerance to UK weather and its weight making door panels relatively light and easy to operate. A lot of people say they do not like the maintenance of timber however it is the only material that you can actually maintain relatively easily if you get any surface damage and with modern wood treatment stains you can get a lot of years before any recoating is required. Always use a microporous woodstain if possible as recoating is very easy when required. 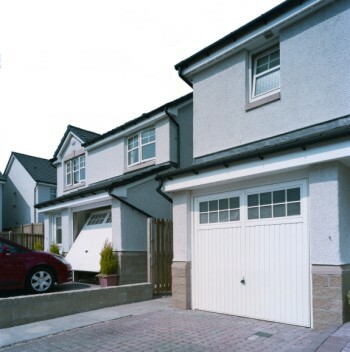 Upvc garage doors are not generally available now and as a material Upvc is not ideal for garage doors with little strength on its own relying on a strong sub frame or alternatively being double skinned and filled with foam or some other material between the 2 sheets and then the costs rise to become higher than a far superior double skinned steel door with a proper surface finish. 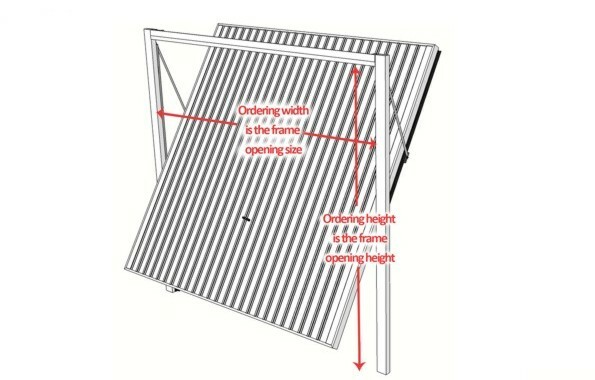 When talking about up and over garage door sizes the reference is always to the internal sub frame dimensions. This is the frame for fixing the door panel to and is either produced in a timber or steel box section. 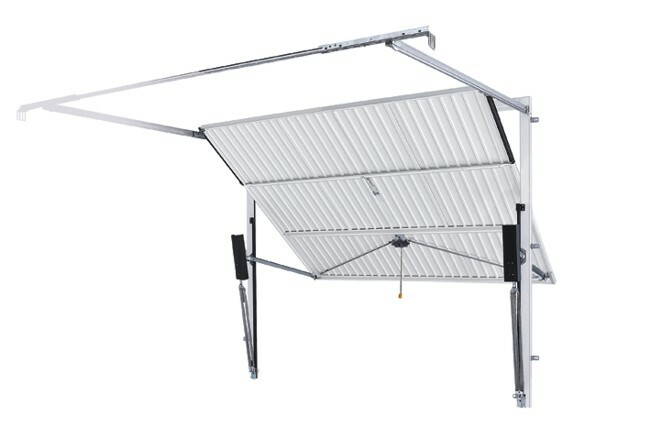 A 7 feet by 7 feet garage door (2134mm x 2134mm) ordering size refers to the daylight opening size of the sub frame and the garage door panel itself is always smaller for operating tolerances. Sub frame sizes themselves vary depending on the gear and manufacturer required – so beware of overall size dimensions! The actual drive through width and height of any one piece up and over garage door will never be the same as the ordering size. The door panel also hangs down in the opening when the door is up and reduces the drive through height depending on the thickness of the panel itself and the drive through width is also reduced as mentioned above when using retractable door gear. The optimum single garage door size is about 8’0” wide (2438mm) to allow easy access of a vehicle, the height depends on other factors such as building restrictions or taller 4 x 4 vehicles. For double width doors the size has been 14ft (4267mm) for years now but many people find this a little too narrow with modern car widths. Up and over garage doors can only be installed either inbetween or behind the structural garage opening. Due to the way they operate, up & over garage doors cannot be installed in front of the garage structural opening. The installation position is usually dependant on sizing restrictions or the finish and depth of the garage piers, although aesthetics quite often becomes a major factor. A garage door fitted onto the inside face of an opening can be wider and higher than a door fitted inbetween the same size opening. When fitting inbetween careful attention must be given to the total width and height including the steel or timber sub frame used for fixing the door. These frame sizes differ from one manufacturer to another and also dependant on operating gear used. If you are not sure please call or Email us, it could mean the difference between getting your vehicle into the garage or not! 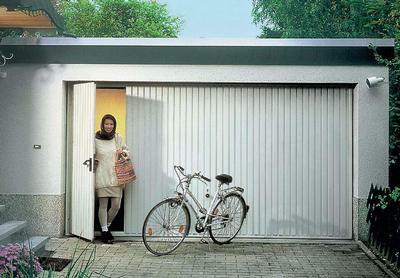 The up and over garage door is still the most versatile when it comes to materials and designs. The one piece panel structure means that doors can be made from steel, fibreglass, Upvc and most types of timber. We have designed and manufactured many wonderful timber up and over garage doors over the years along with some very large steel and GRP doors. More recently however the maximum available width of a one piece up and over garage door has reduced due to stricter safety legislation and the sectional garage door has stepped into its place. Steel is the most economical choice of door panel. 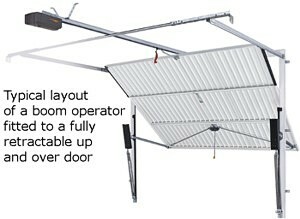 All new up and over garage doors can be remote control automated using either a ceiling mounted boom operator whether they are canopy or retractable operating mechanisms..
Automating a canopy type up and over garage door will require the use of a bow arm converter if installing with a traditional boom type operator. A retractable up and over door is always preferable if the option is available as a bow arm is then not necessary. Adding a remote control operator to an existing garage door is possible for about 90% of doors currently in use, unfortunately some door have a very odd geometry and cannot be safely made automatic by any means and therefore would need replacing with a new complete garage door and mechanism. The range of controls available today are vast with wall mounted internal and external access controls and a selection of remote control devices to cover all requirements including finger readers, timers, card readers, digital keypads and so on. A range of matching side doors are available with the majority of the Hormann range of sectional and up and over garage doors. These are manufactured in either single skin or double skinned steel or timber and are generally an exact copy of the garage door itself in a range of very useful standard and purpose made sizes. It is possible to have a limited range of steel and timber up and over garage doors with pedestrian access doors built into the main door leaf to allow access when the garage door is closed. These options are manufactured with very small thresholds to maximise accessability. The pedestrian doors only open outwards but can be either side of the garage door. Sivelox can manufacture a range of timber garage doors with centrally positioned pedestrian doors as an option.